Within each soul there is a division where all the birth-roles of all the births exist. When the soul leaves a corporeal body to take the next birth, the next birth-role is automatically used (as per the World Drama). The birth-role of the previous life will go back to its resting place, within the soul. The new life begins because it is time for the next birth-role to be used. When the soul enters a new corporeal body, when the foetus is around four and a half months old, the new birth-role emerges to play it’s role. This birth-role or Ka will begin to develop as the corporeal body changes. One can’t live a life on earth without using the relevant birth-role. 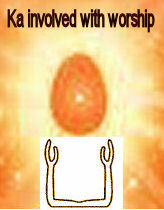 Thus, it was portrayed like as if using the Ka (birth-role) enables one to live on earth. The Ka does not have a free existence as the Ba does. The soul flyies to take a new birth. At the end of the cycle, the soul flies back with God to the Soul World and then in the new cycle, it flies back down into the corporeal world to play its part, as per the World Drama. The Ka remains in its resting place within the soul, when the soul is not living the life of that Ka. The soul continues living through using different corporeal and Ka bodies. The soul experiences happiness and pain through the corporeal and Ka bodies. The Ka can also be seen as a double because there are 2 aspects to the Ka. There is the original birth role (Ka) that exists deep within the soul and which emerges to play a role as per the World Drama. There is also a lower Ka which develops as we learn and change in the corporeal world. The lower Ka develops based on the knowledge and experiences acquired in life. The original birth-role (Ka) which already exists deep within the soul, can be seen as the higher guardian-angel-like Ka. Based on what has to happen in the life of that Ka, as per the World Drama, the lower Ka’s live is lived. Yet, the soul can change things based on the decisions which he takes in his life. Despite that, the higher Ka is the basis upon which that life is lived. The life is lived based on what was intended for that Ka in the World Drama. So it is as if we have a ‘double’ Ka based on the 2 different aspects of the Ka. At the end of that life, the original Ka goes back to its resting place, in the soul. The changes which we have made goes into our memory bank, in the soul. These changes, in the memory bank, may affect us if those memories emerge. But these changes will not affect the Ka, in its next birth, in the next cycle.